See more objects with the tag study, borders, royalty, royal court, branches, gilt, luxury, ornate, French horns, candles, chandeliers. See more objects with the color rosybrown dimgrey darkolivegreen or see all the colors for this object. This is a Drawing. It is dated 1777 and we acquired it in 1921. Its medium is pen and ink, brush and watercolor on paper, lined with paper and framed with brown paper stripe. It is a part of the Drawings, Prints, and Graphic Design department. 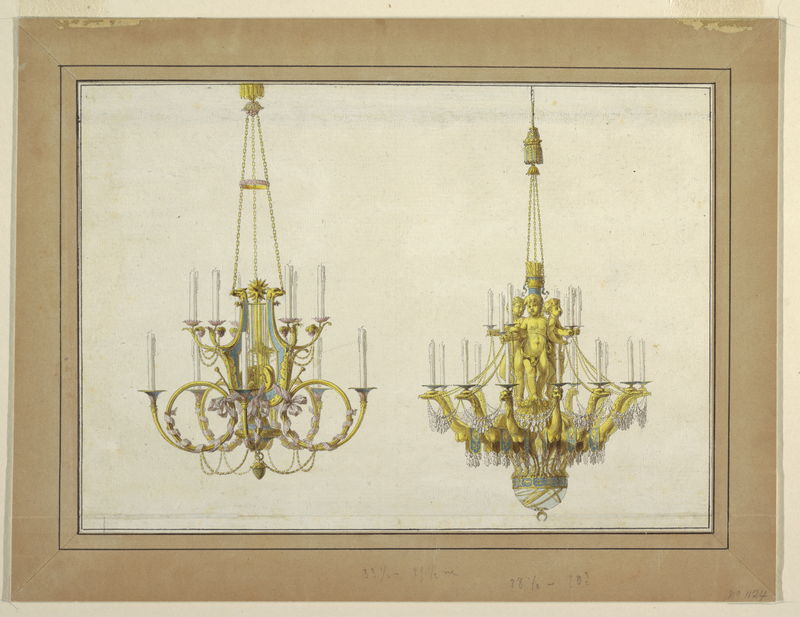 This highly finished watercolor presents a design for two double-tiered chandeliers by Jean Démosthène Dugourc (1749-1825), the French architect who served as a furniture designer to the French crown and later became the first architect to the King of Spain. These chandeliers would have been executed in gilt bronze, porcelain and rock crystal. The left chandelier takes the double-headed eagle topped lyre as the central element. The lower tier of candles are supported by a base inspired by hunting horns and the candleholders in the top level are in the shape of flower boughs. The right chandelier has a group of four putti as the central shaft. The candleholders in the lower row are in the shape of fantastic birds, perhaps griffins, adorned with crystal drops. The birds in turn rest on an armillary sphere, an early astronomical instrument. The upper level of candles is held by the putti. 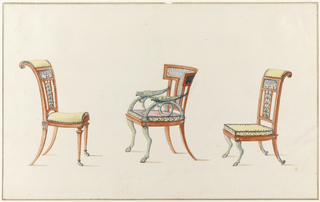 The largest of the two designs was intended for the Salon de Parade in Comte de Nord’s Palace of Camenoïstrof in Russia. The designs display a fantastic combination of neoclassical motifs, collaged together in service of ornament. Watermark: C [lower case alpha] D BLAUW.